Nitro FM broadcasts from early each race day morning until at least 10pm at night with a selection of great music, interviews and chat to keep you company throughout your stay. Join The Nitro FM Team! Calling all budding radio presenters! 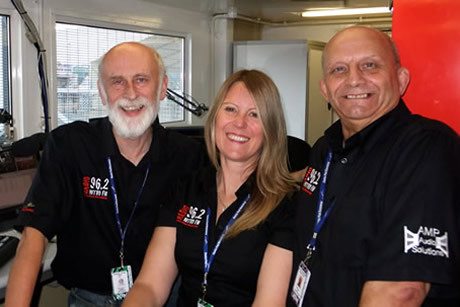 Santa Pod Raceway is looking for aspiring Radio Presenters to expand the team within its event radio station 96.2 Nitro FM! If you love drag racing and love the idea of joining our team at selected events throughout the season then we want to hear from you. You’ll get to hang out in the Nitro FM studio and present new shows, interview your favourite riders and drivers and help develop new formats and ideas for our worldwide audience. As a presenter, you’ll be the voice of the radio station creating the tone and the style of Nitro FM’s unique output and establishing relationships with listeners. You’ll also get the chance to be part of the live web broadcasts for the major Championship events held at Santa Pod Raceway in May and September. Previous presenter experience is not essential (but will be an advantage) however, you’ll need to demonstrate confidence on-air, communicate engagingly with audiences, have a decent knowledge of the sport and be flexible with event dates for early and late shifts. The role is volunteer during a trial period and then a seasonal contract if successful. We will need to hear a short demo of a few minutes from you - this can be just something you have recorded on your phone as we want to hear how you sound and how lively and interesting you can come across to the listeners. It only needs to be a few minutes and can be you talking about an interest of yours or preferably Santa Pod!! Send your demo to the Santa Pod team via email nitrofm@santapod.com. Good Luck! At each event there is an upbeat programme format based around live race commentary as it happens. Throughout the race weekend you'll also get to listen to many exclusive interviews from riders and drivers plus a host of competitions courtesy of the many sponsors here at Santa Pod. Nitro FM want you to get involved when on air - text them a message, ask them a question or just request your favourite tune. Paul Wright (Oz) - A long time motor sports fan, was converted to Drag Racing in the 70's when persuaded by a friend to visit Santa Pod, to watch an American chap called "Garlits", Peter Crane stole the show that day, hooked ever since. A VW fan I attended the first 5 Bug Jams and helped put the VW Display together in the REME Museum in Arborfield. Music buff with a vast collection dating from the Doo Wop and Rockabilly period all the way up to modern day bands. My three teenagers make sure I don't miss anything. I love music trivia. I have been DJing or compering since the early 70's. Nikki Skinner - A new fan of drag racing my first taster was the main event in 2011 which had me immediately hooked and spending whole weekends at the track. The main event 2012 saw me meeting the nitro team and after a chat on the radio as a newbie racing fan I was asked to join the team for the next event. From there my involment has grown. Although this is my first experience behind the mike, music is an important part of my life and I love being able to share my choice of tunes on Nitro and hope you enjoy my taste too. Rob Ashard - Rob Ashard has had two passions in his life since the 1970's. The first was drag racing, fuelled by the presence of the Corgi toy Commuter and Quatermaster dragster, so Rob got his dad to take him to see drag racing at Santa Pod and Blackbushe. In the mid 70's Rob was also a keen listener to Radio Caroline which was then an album station, playing mainly rock tracks from the likes of Pink Floyd, Genesis, Yes and Supertramp. He joined Hospital Radio Ipswich in 1976 as an engineer and presenter. In 1980 he got a job in the field that he is still in today. It was in the sound department at London Weekend TV, where he stayed until going freelance in 2004, Rob has worked on many very well-known shows being in charge of the sound on The Graham Norton Show, I'm A Celebrity, Get Me Out Of Here!, Dancing On Ice, as well as doing most of the Michael McIntyre and Lee Evans DVD's. These days he does the occasional air-shift on Radio Caroline, still on the air today with many of it's former ship-bourns DJ's at www.radiocaroline.co.uk. Rob is also a longtime Corvette fan and has his own 1975 C3 and has been a CCCUK member since 1997. He says, "To work on Nitro FM is fantastic. I get to zip up my two anoraks together!". If you can't make it to the raceway for every day of a meeting you can now listen online at Nitro FM. Thanks to you all who enjoy our output and don't forget to put in those requests for your favourite music, You say it we play it. Why not advertise your company on Nitro FM? Radio commercials can be broadcast at all major events and are a fantastic way to promote your company, services and products. Call the Santa Pod marketing team to discuss a tailor made production on 01234 782828. Nitro FM would like to hear from any listeners with thoughts, views and suggestions on how they can re-tune Nitro FM to ensure that the service for the upcoming season is better than ever! To contact Nitro FM please complete the form below.